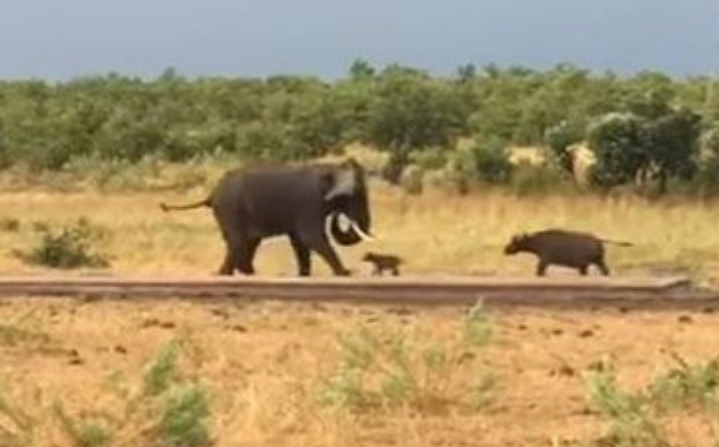 This is the moment that a brave baby buffalo took on an elephant in a David and Goliath-style savannah battle but managed to scare off the enormous mammal. In astonishing footage of the encounter the fearless calf proves size doesn't matter in the animal kingdom as it charges towards the gentle giant. Rather than protecting her baby the buffalo's mother is left trailing in the background as the youngster bounds towards the elephant - which is an estimated 20 times larger. After spotting the miniature buffalo the trumpeting animal - which can weigh up to 6,000kg - springs into reverse before spinning around and making a dash in the opposite direction. The video was captured by financial advisor Andrew Cohen who was visiting Kruger National Park in South Africa for a safari with his partner Candice. He said that while the elephant could have 'easily hurt' the buffalo it appeared that the enormous animal 'sensed that this was an innocent newborn and that it didn't mean any harm'. 'The sighting ended when the elephant ran away into the bush, and the cow and calf also went their separate ways. Responses to "David and Goliath-style: Brave baby buffalo chasing off a giant elephant "
I don't think that baby calf is attacking. Just confused like most cattle get. Mum is backing it up just in case it goes all wrong. Once baby is away from the elephant it stays with mum. Babies do weir things and are easily confused.